A better nonparametric estimation approach is offered to reduce the finite-sample bias and variance of the semiparametric efficient estimator for the bivariate distribution of failure time and marker. For bandwidth selection, practically feasible and theoretically valid procedures are proposed. By adopting the smoothing technique of Lloyd (1998) with respect to a marker status, we further show that only some retrospective accuracy measure estimators can enjoy the advantage in variance reduction. A general theoretical framework is developed for the proposed time-dependent accuracy measure estimators. With appropriate modifications, our estimation approach is further extended to accommodate various types of censored survival data. Two-dimensional turbulence with vortex and filamentation structures is studied in the context of typhoon dynamics. With aircraft observations and simple barotropic model calculations, we demonstrated the possible importance of vortex scale filamentation dynamics in suppressing deep convection and organizing spiral bands, which may affect the development and evolution of tropical cyclones. The filamentation dynamics is also related to the “moat” formation and “moat size” in the concentric eyewall typhoons. The dynamics shed light on the progress of typhoon dynamics and is cited in a review paper as important new mechanism for concentric eyewalls. 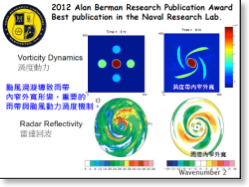 The research also is the recipient of 2012 Alan Berman Research Publication Award of Naval Research Laboratory. The Award is for the best publication in the US Naval Research Lab. A class of approximate Lennard-Jones (LJ) potentials is found by the method of Fourier analysis. When the LJ potential is replaced by the approximate LJ potential, the total energy functional becomes simple and useful to derive the Poisson-Nernst-Planck equations with steric effects (PNP-steric equations), a new mathematical model for the LJ interaction in ionic solutions. 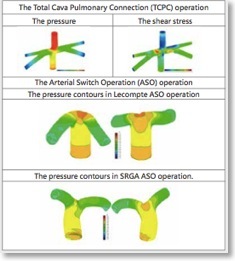 Such a model is effective for numerical experiments and mathematical analysis. 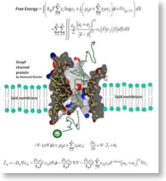 Analytical and numerical results may show the selectivity of biological ion channels including the calcium (EEEEE, EEEA) and sodium channels (DDEKA). We model cavitating flows by a variant of the six-equation single-velocity two-phase model with stiff mechanical relaxation of Saurel-Petitpas-Berry [J. Comput. Phys. 228, 1678 (2009)]. In our approach, we employ phasic total energy equations instead of the phasic internal energy equations of the classical six-equation system. This alternative formulation allows us to easily design a simple numerical method that ensures consistency with mixture total energy conservation at the discrete level and agreement of the relaxed pressure with the correct mixture equation of state. Temperature and Gibbs free energy exchange terms are also included in the equations to model heat and mass transfer. This is done by a stiff relaxation solver that forces thermodynamical equilibrium at liquid-vapor interfaces under metastable conditions. 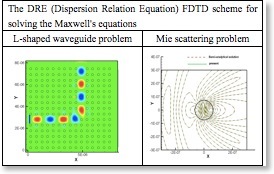 The algorithm uses a high-resolution wave propagation method for the numerical approximation of the homogeneous hyperbolic part of the model in that a hybrid HLLC/Roe Riemann solver is employed in a fully-discretized version of the method in multiple space dimensions. Sample numerical results for a piston-induced depression of liquid-dodecane drop in a dodecane vapor-filled domain are shown below, observing different solution behaviors over time with (on the left) and without (on the right) thermal-chemical effects to the flow. (joint work with Marica Pelanti, Paris Tech, France). A novel THINC-based Eulerian interface-sharpening methods is developed also for the efficient computation of compressible flow problems (joint work with Feng Xiao, Tokyo Tech, Japan). Nano-scale mechanical and optical materials are the building blocks of advanced technologies such as photonic circuit, solar energy, and bio-sensing devices. Focusing on numerical simulations of three-dimensional photonic crystals and plasmonic crystals, we have developed highly efficient algorithms to solve the resulting band structure large-scale eigenvalue problems and material structure optimization problems. We intend to advance the progress on other applications by developing new and fast algorithms on the latest parallel computers. We conduct theoretical studies, algorithmic designs, and software developments on GPU and high performance computers for contemporary scientific and industry computational challenges. Our focuses include large-scale linear system and eigenvalue solvers, statistical surrogates assisted auto-tuning for computer experiments, and derivative free methods for high dimensional and complicated optimization problems. The proposed methods are expected to be enabling computing kernels for medical imaging, smart material, semiconductor manufacturing, the next generation computers, and green building.